I read a post today entitled ‘What Program to Follow’ (thanks Sarah!). It mentions a few different programs, one of them being The TM or Texas Method. Justin Lascek of 70s Big has written a great ebook on the ins and outs of the program and how to apply it effectively. 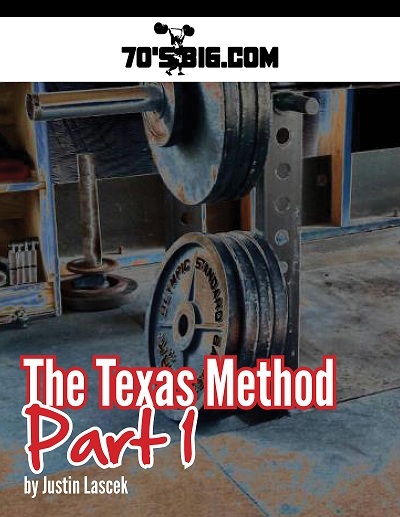 The ebook comes in two parts; part 1 is an introduction and outline to the program and the newly released, part 2 is for the more advanced lifter. Buy the book…both parts…read them…really read them, not just skim. Then start the program…SLOWLY. This entry was posted in Lifting and tagged 70s Big, Justin Lascek, squat, Texas Method, training program by athleticevolution. Bookmark the permalink.